“They’ve put a woman on the stage!” Nell Gwynn (Alison Luff) becomes a stage sensation in England. (Also pictured l to r: Catherine Flye, Quinn Franzen, Christopher Dinolfo, Kevin Collins.) Photo by Brittany Diliberto. Nell Gwynn is the tale of one of the first female actresses in Shakespearean times, and her journey from orange seller, to actress, to mistress of King Charles II, and back to the theater. It’s a lighthearted, feel good performance, that’ll have you laughing out loud while celebrating the eponymous heroine. Nell Gwynn’s story is given a stage by playwright Jessica Swale and when women write female characters, they are infinitely more nuanced and poignant. As the character John Dryden says, with women playing female characters, they “won’t need to be so feminine anymore.” This allows for narratives that actually pass the bechdel test and look beyond stereotypical female portrayals (like the nurturing mother, the virginal bride, the hysterical wife, the overly sexual mistress, or any combination therein). Nell Gwynn, beautifully portrayed by Alison Luff, is instead witty, crass, and not afraid to stand up to men who dominate the theater and British royalty. Gwynn’s rise in theater is met by derision, both from her fellow actors and the public who see actresses as another form of prostitutes. It’s unfortunate that her story has to be told in relation to the two romances in her life: Charles Hart and King Charles II. The King’s Company in performance in the Restoration-era comedy Nell Gwynn. Pictured l to r: Alex Michell, Caitlin Cisco, Catherine Flye, Christopher Dinolfo, Nigel Gore. Photo by Brittany Diliberto. Luff’s Gwynn is supported by an incredibly talented and accomplished ensemble. I was surprised by the 13 person cast in such a small venue, but instead they provided a cohesive vibrancy across the distinct scenes. 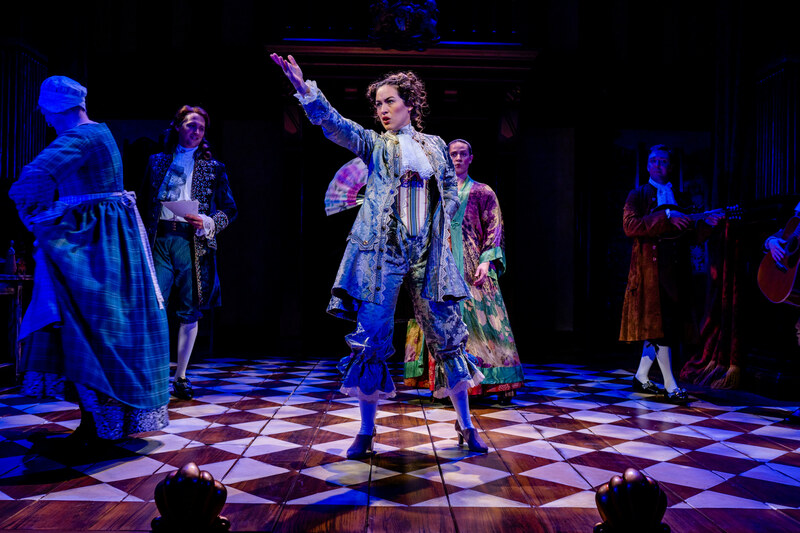 A stand out was Christopher Dinolfo’s Edward Kynaston, who delivered well-timed comedic interludes with an appropriate balance of scorn as his character, who normally plays the female roles at the theater, feels jilted by Gwynn’s arrival. One minor complaint with the show was that it was overly bawdy. The heavy handed sexual innuendos and poop jokes, while fitting of the times, overshadowed the more nuanced allusions to history and Shakespeare’s works. In an effort to add extra laughs, I hope the audience doesn’t lose the intended focus of the play, Gwynn’s tenacity in spite of the challenges she’s been dealt. “I’ll trust no poet, but I’ll write my own.” exclaims Gwynn during her closing monologue, bringing us back to the agency that comes with giving a woman her own stage and actually listening. This was my first show at the Folger Theatre, but not my first visit to the Folger Shakespeare Library, located in the same building. The Folger Shakespeare Library is a hidden gem in DC’s museum scene; while they are known for having over 90 of the approximately 300 surviving First Folios and an extensive Shakespeare research library, over half of their research is done on historic texts, as demonstrated by their current exhibit, First Chefs: Fame and Foodways in Britain and the Americas, on early food writings. The museum also has some of the most engaging and informed docents I’ve ever had a tour by. Nell Gwynn will be at the Folger through March 10, so definitely grab your tickets to learn about this trailblazing woman and be awed by the powerful ensemble. Make sure to go early to check out their exhibit and get a drink before the show. Four-time Tony winner MEMPHIS in D.C. May 1-2: Tickets on sale now!